InstsaTxtr might just be the best thing to happen to iPhone toting Instagrammers, with a set of excellent features that complement the service perfectly and a gorgeous design to boot. A photo editor that gives you a range of powerful editing tools in a streamlined and easy to use interface, InstaTxtr is really the only companion to Instagram that you will really ever need. It gives you far more control over your photos than you would otherwise have and allows you to achieve things that the main Instagram app just can’t do. To be honest, even though it is clearly aimed at Instagrammers, it works perfectly well as a standalone photo editing app that competes well with other editing apps on the App Store. 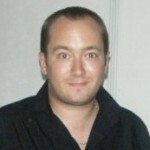 The app allows you to do just about anything with a photo and is feature packed. The cropping tool, alongside the wide range of filters and photo frames gives you a wide range of flexibility. There are 126 filters, 24 frames and even adjustable light leaking which is impressive in anyone’s book. 34 Original filters, 32 Tone filters, 21 Color filters, 13 Glow filters & 20 Tone 2 filters. 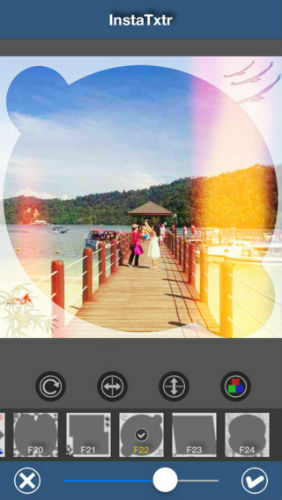 InstaTxtr has 52 overlays/textures which let you apply light leaks, fancy lights to your photos. You can easily tweak the colors of overlays to make them blend best with your photos! InstaTxtr comes with 24 beautiful photo frames for full or square-sized images. InstaTxtr also comes with square-ready frame that allows you to post full-sized photo to Instagram, you can easily position/scale/rotate your image within the square by using pinch, touch & drag gestures. Square-ready frame can be changed to any color you want. You can easily crop your photos with 13 preset cropping tools. And you can also rotate, flip horizontally or vertically for your photos. Perhaps the most impressive aspect of the app is the ability to use a lovely square ready frame that allows you to post full-sized photos to Intagram. It is a brilliant idea and one that other apps will definitely be looking at. The app is a breeze to use. Even with all the features and abilities at your disposal you will never get lost and there is even a full image history function to help you out. The interface is decent, and is never confusing, which is something rare on the market, as app’s usually get more difficult to use when you are using advanced cropping features, but here it is never a problem. Overall, this is a fantastic photo editing app that is an Instagrammer’s dream. 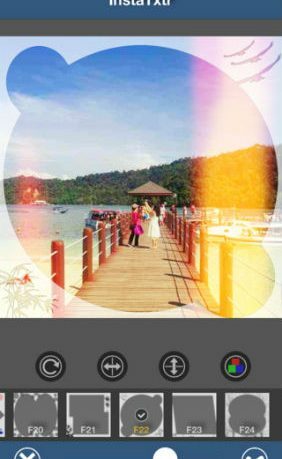 With powerful and flexible tools, InstaTxtr is an essential app for fans of photo editing.